DeansCards.com recently received a 1954 Bowman baseball card complete set and it got us thinking about one of the special features of this unique set - the variation cards. The set itself has 224 total cards that were broken up into two series for distribution: #1-128 and #129-224. However, many pricing guides maintain only a single pricing series, meaning that all common cards have the same value throughout the entire set. 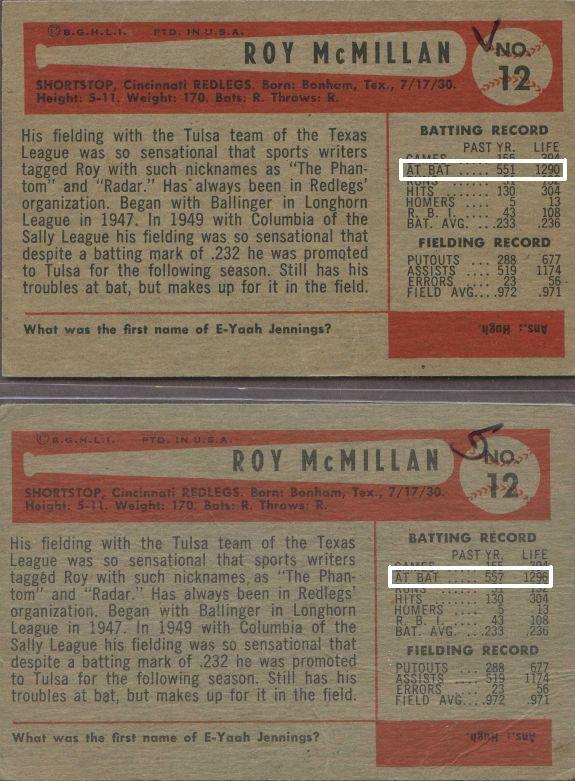 Interestingly, the 1954 Bowman baseball card set does not have many marquee rookie cards. Don Larsen provides the only well known rookie card in the set. Aside from the rookies, this set is also missing many of the popular star players of the time. Bowman did, however, employ some creativity in its numbering of the set. There is a 16 card rotation, meaning that one team, in this case, the Yankees, would have card numbers 1, 17, 33, 49, etc, while the second team, the Red Sox, would have 2, 18, 34, 50, etc. This team rotation arrangement would not be seen in another vintage set. As for the variations, a surprising 40 card out of 224 total have some sort of variation. 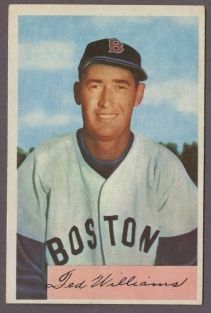 The most prominent variation by far is the #66 Ted Williams card. Williams had been serving in Korea, as his 1959 Fleer baseball card set dutifully memorializes, and made his return to baseball in 1954. However, Williams signed an exclusive contract with Topps, so the Bowman Company, which had rushed to get its set out before Topps, had to withdraw the Williams card and replace it with Jimmy Piersall, who already had card #210. Bowman’s hurry to get its set released before Topps resulted in not only the Williams/Piersall variation but many others. 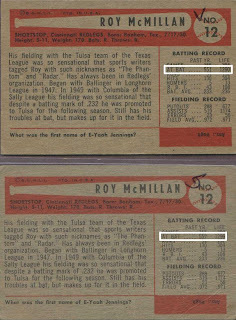 Variation cards have differences in statistics, birthplaces, trades, and even answers to the quiz questions on the back. 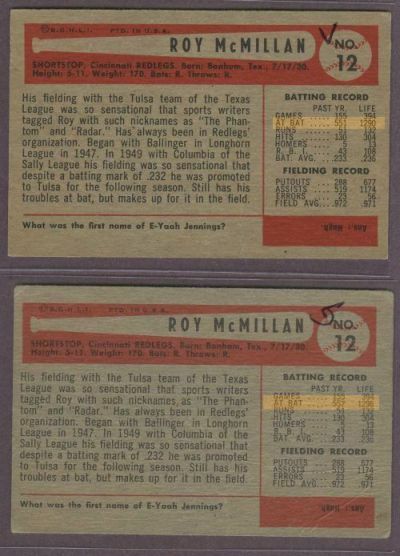 The example we have included is the #12 Roy McMillan card. The first card that Bowman released for McMillan has the following stat line: 551 season ABs, 1290 lifetime ABs. The correct stat line should read 557 season ABs, 1290 lifetime ABs. Although this seems like a minute difference to the casual observer, Bowman had to correct a similar mistake 40 times throughout the set. This set represents the pinnacle of the competitive baseball card era and we certainly appreciate the rich history that resulted from this heated competition. Has anyone ever seen an uncut sheet of 1954 Bowman baseball? Baseball Cards magazine published an article on this set in the 1980's which stated that the cards were printed on one 224 card sheet with 14 rows and 16 columns. Other sources claim that there were seven 32 card sheets with four rows and eight columns.